I'm a homebody. A real, honest-to-goodness, I-could-stay-inside-for-weeks type of homebody. I've built a home-friendly business (spinning and dyeing requires that I remain near my kitchen and couch!) and if it weren't for the dayjob, I might never venture forth. Which is exactly why I insist on applying to crazy-huge, far-away craft shows. They challenge me and stretch me and, yeah, force me out of the house. The last two weeks, nay, the last two months have been consumed with preparing for Urban Craft Uprising. I made more yarn than I ever thought possible, created a new “mini-series” (yarn with jingle bells! 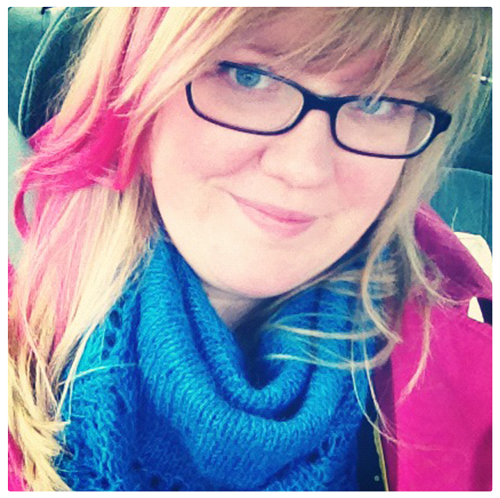 yarn with pompoms! 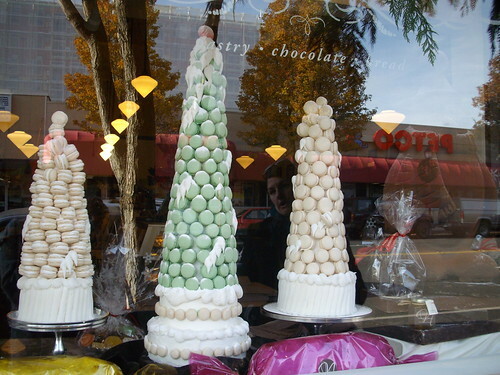 Holiday Happiness!) and packed it all up and lugged it across the country. 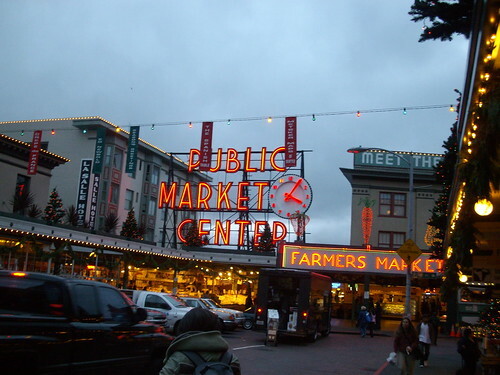 Once in Seattle, I met customers, vendors, authors! I explored, I rode busses and ferries and planes, I consumed hundreds of cups of coffee (if you'd like a coffee review, I kept embarrassingly detailed notes, which I'd be happy to share here). So fun and so worth it, but also a little too much. I was only gone for one week but for the two months preceding I allowed my entire life to be focused on preparing for the show, keeping the Boutique stocked and fulfilling custom orders. I love being that busy, feeling the crush, buzz, but the truth is, it's not healthy. I promised myself that when I was done with the show, I would take a step back. But being away from what I love the most (you, the fiber, the color) isn't healthy either. When I returned, I eased myself back into it. I've been away from my dyepots and my wheel and the whole business for one FULL week. I thought it would be restful but I feel all at odds. So odd, I've actually done a lot of *gasp* cleaning. Like, my whole house. Obviously, I'm not well. I need to work on balance: yarn time and personal time. Accomplishment and relaxation. I'm going forward with that intention. 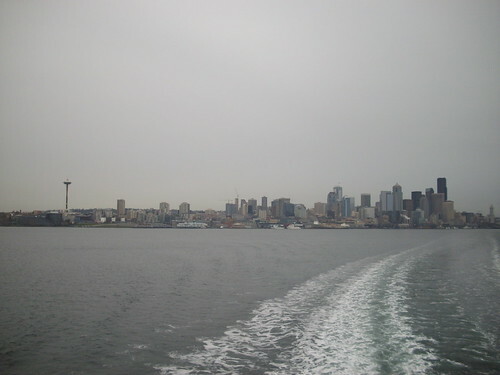 That said, I can't leave Seattle behind without a second glance! A quick sum up: Urban Craft Uprising was magically delicious. I brought NONE of my own display units, everything I could possibly need was donated by the wondrous Kayce, of World of Whimm. My friends helped me at the booth (that's Carissa above) and I met the most fabulous customers. 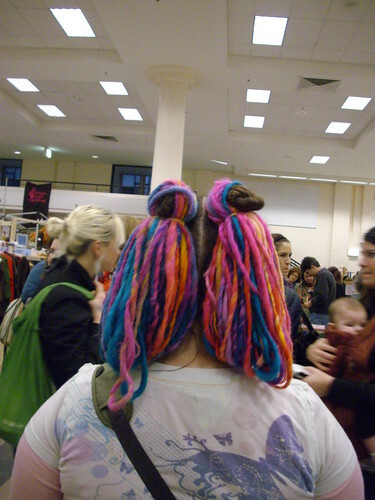 Like this one, who bought the yarn on Saturday and returned on Sunday, with it as her hair. Weird. and Wonderful. The girls (3 of my college roomates) managed to show me every good thing in West Seattle. 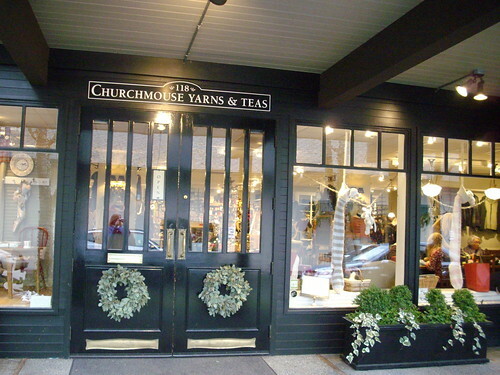 It was here that I experienced the best yarn store of my life, Churchmouse Yarn & Teas. All in all, a really smashingly wonderful trip. It certainly consumed my life there for a while, so I don't intend to do any more shows until next summer. But I AM on the lookout for more big shows like this one (I need to get out of the house, remember?) Big enough to sink my teeth into and to push me into adventuring places I never thought I would. 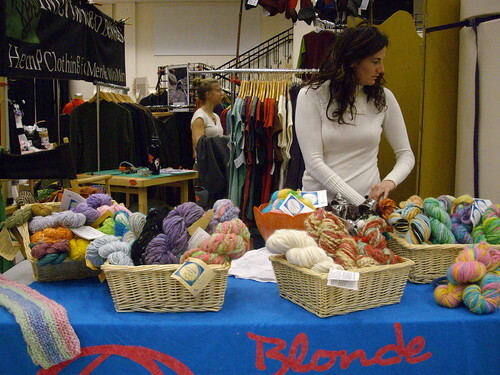 With that in mind, as I sneak back into my regular routine of dyeing, spinning and blogging, can you share your favorite craft (or yarn or knitting) show? Do you have adventures in your town that I simply can't miss? FYI – The statue of “Stalin” is actually a statue of Lenin. Just thought I'd let you know. All them evil Russians* cornfuse me too. 😉 They were all the same.